← How to print webpage to png? Only several clicks will help you convert scanned PDF to XLSX in batches and the operation will be no more easier when you use the application PDF to Excel OCR Converter as your assistant. This application use the OCR technology to extract text from scanned PDF document exactly and convert them to Excel files. Six kinds of languages are supported to be recognized in this application. 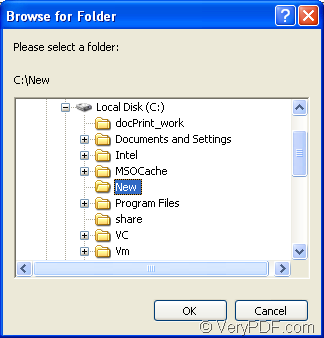 There are also many other kinds of OCR applications or document converters in the website of VeryPDF http://www.verypdf.com/. If you want to get more information about them, just visit the website yourself. Before using the application, you need to download it via clicking this URL: www.verypdf.com/dl.php?file=verypdf2excelocr.exe. You also need to install it on your computer by following with the installation wizard. The download URL is for supplying the free trial version of the application. If you need to buy it, please enter its homepage where gives you five kinds of registration licenses: http://www.verypdf.com/pdf-to-excel-ocr/index.html. When you want to open the PDF to Excel OCR Converter, you can double click the desktop icon of it or right click it and click “Open” option to open the application. You can also click “Start”—“All Programs”—“VeryPDF PDF to Excel OCR Converter v2.0”—“VeryPDF PDF to Excel OCR Converter v2.0”. 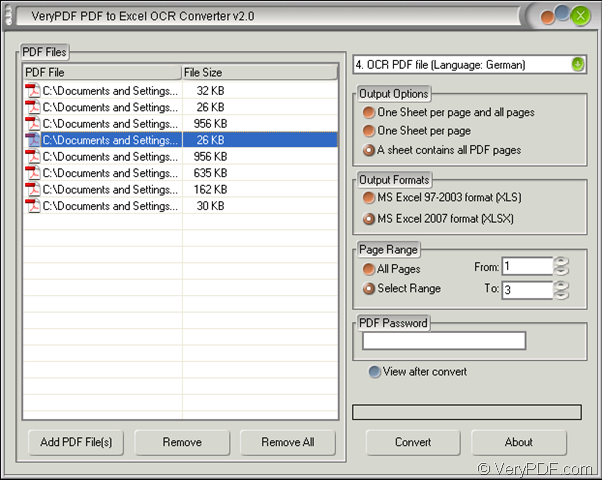 In the opened interface of the application, please do as follows: The snapshot in Figure 1 is the main interface of PDF to Excel OCR Converter. Please click “Add PDF File (s)” button to open “PDF to Excel” dialog box in which you can choose the scanned PDF documents into the application. Right click file list and click “Add files” option in floating item to open “PDF to Excel” dialog box and choose PDF documents. Drag the files you need into file list directly. Choose the corresponding language to be recognized in dropdown list in top right corner. Select a good output layout for all the target files in “Output Options” group box. Set output format as “MS Excel 2007 format (XLSX)” in “Output Formats” group box if you want to convert scanned PDF to XLSX. If you want to convert PDF documents with all pages to XLSX files, please check “All Pages” option in “Page Range” group box. If you want to convert several pages of PDF documents to XLSX files, please check “Select Range” option to activate “From” and “To” edit boxes and then input the page number you need into them. PDF to Excel OCR Converter also supports to convert encrypted PDF to XLSX as long as you can input the open password in “PDF Password” edit box. 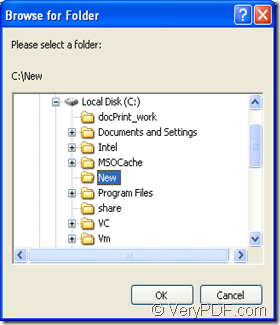 Click “Convert” button to open “Browse for folder” dialog box to search for a output location for target files. Please see the dialog box in Figure 2. Then click “OK” button to run the conversion from scanned PDF to XLSX. So those are all about the operations. If you still have questions, welcome to leave a message or come to our live chat support.